Terence Hankin qualified in Medicine at Liverpool Medical School in 1989. He trained in Anaesthesia and Critical Care in the Mersey region and completed a Critical Care fellowship in Canada. He was appointed a Consultant in Anaesthesia and Critical Care at St Helens and Knowsley Acute( STHK)NHS Trust in 1997. Terence is part of an 8 Consultant team providing Critical Care services to the population of St Helens and Knowsley, with a special interest in Burns Care. 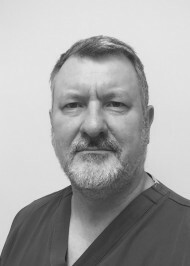 Terence has 25,years experience in Anaesthesia. He provides a wide range of Anaesthetic services with a special interest in Plastic and reconstructive surgery. Current developments are the provision of Anaesthesia to Adults and Children for specialist spasticity therapy.